The Willis Tower, built as and still commonly referred to as the Sears Tower, is a 110-story, 1,450-foot (442.1 m) skyscraper in Chicago, Illinois. At completion in 1973, it surpassed the World Trade Center in New York to become the tallest building in the world, a title it held for nearly 25 years; it remained the tallest building in the Western Hemisphere until the completion of a new building at the rebuilt World Trade Center site in 2014. The building is considered a seminal achievement for architect Fazlur Rahman Khan. The Willis Tower is currently the second-tallest building in the United States and the Western hemisphere – and the 16th-tallest in the world. More than one million people visit its observation deck each year, making it one of Chicago's most popular tourist destinations. The structure was renamed in 2009 by the Willis Group as a term of its lease. As of April 2018[update], the building's largest tenant is United Airlines, which moved its corporate headquarters from the United Building at 77 West Wacker Drive in 2012, occupying around 20 floors. Other major tenants include the building's namesake Willis Group and law firms Schiff Hardin and Seyfarth Shaw. Morgan Stanley plans to move to the building in 2019 and become its fourth-largest tenant by 2020. In 1969, Sears, Roebuck & Co. was the largest retailer in the world, with about 350,000 employees. Sears executives decided to consolidate the thousands of employees in offices distributed throughout the Chicago area into one building on the western edge of Chicago's Loop. Sears asked its outside counsel, Arnstein, Gluck, Weitzenfeld & Minow (now known as Arnstein & Lehr, LLP) to suggest a location. 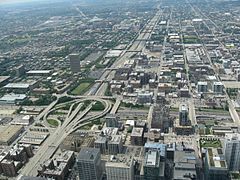 The firm consulted with local and federal authorities and the applicable law, then offered Sears two options: the Goose Island area northwest of downtown, and a two-block area bounded by Franklin Street on the east, Jackson Boulevard on the south, Wacker Drive on the west and Adams Street on the north, with Quincy Street running through the middle from east to west. After selection of the latter site, permits to vacate Quincy Street were obtained. Attorneys from the Arnstein firm, headed by Andrew Adsit, began buying the properties parcel by parcel. Sears purchased 15 old buildings from 100 owners and paid $2.7 million to the City of Chicago for the portion of Quincy Street the project absorbed. Sears, which needed 3,000,000 square feet (280,000 m2) of office space for its planned consolidation and predicted growth, commissioned architects Skidmore, Owings & Merrill (SOM). Their team of architect Bruce Graham and structural engineer Fazlur Rahman Khan designed the building as nine square "tubes" (each essentially a separate building), clustered in a 3×3 matrix forming a square base with 225-foot (69 m) sides. All nine tubes would rise up to the 50th floor of the building, where the northwest and southeast tubes terminate. The northeast and southwest tubes reach the 66th floor; the north, east, and south tubes end at the 90th. The remaining west and center tubes reach 108 floors. The Sears Tower was the first building to use this innovative design. It was both structurally efficient and economic: at 1,450 feet, it provided more space and rose higher than the Empire State Building and cost much less per unit area. The system would prove highly influential in skyscraper construction and has been used in most supertall buildings since, including the world's current tallest building, the Burj Khalifa. 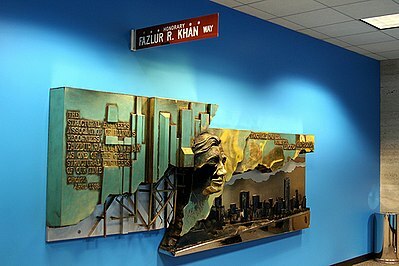 To honor Khan's contributions, the Structural Engineers Association of Illinois commissioned a sculpture of him for the lobby of the Willis Tower. Sears decided to focus their initial occupancy on housing their merchandise group, renting out the remaining space to other tenants until needed. The latter floor areas had to be designed to a smaller footprint with a high window-space to floor-space ratio to be attractive to prospective lessees. Smaller floorplates required a taller structure to yield sufficient square footage. Skidmore architects proposed a tower with large, 55,000-square-foot (5,100 m2) floors in the lower part of the building with gradually tapered floorplates in a series of setbacks, which would give the tower its distinctive look. As Sears continued to offer optimistic projections for growth, the tower's proposed floor count increased rapidly into the low hundreds, surpassing the height of New York's unfinished World Trade Center to become the world's tallest building. The height was restricted by a limit imposed by the Federal Aviation Administration (FAA) to protect air traffic. The financing of the tower was provided by Sears. It was topped with two antennas for television and radio broadcasting. 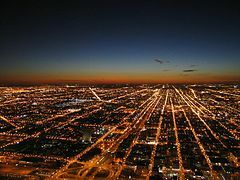 Sears and the City of Chicago approved the design and the first steel was put in place in April 1971. The structure was completed in May 1973. The construction cost about US$150 million, equivalent to $850 million in 2019 dollars. By comparison, Taipei 101, built in 2004, cost the equivalent of US$2.21 billion in 2018 dollars. Black bands appear on the tower around the 29th–32nd, 64th–65th, 88th–89th, and 104th–108th floors. These elements are louvres to ventilate the building's environmental support systems and obscure its belted trusses. Even though regulations did not require a fire sprinkler system, the building was equipped with one from the beginning. There are around 40,000 sprinkler heads in the building, installed at a cost of $4 million. In February 1982, two television antennas were added to the structure, increasing its total height to 1,707 feet (520.3 m). The western antenna was later extended, bringing the overall height to 1,729 feet (527 m) on June 5, 2000, to improve reception of local NBC station WMAQ-TV. As the construction of the building neared the 50th floor, lawsuits for an injunction were filed seeking to stop the building from exceeding 67 floors. The suits alleged that above that point television reception would deteriorate and cause property values to plummet. The first suit was filed by the state attorney in neighboring Lake County on March 17, 1972. A second suit was filed on March 28 in Cook County Circuit Court by the villages of Skokie, Northbrook, and Deerfield, Illinois. Sears filed motions to dismiss the Lake and Cook County lawsuits and on May 17, 1972, Judge LaVerne Dickson, Chief of the Lake County Circuit Court, dismissed the suit, saying, "I find nothing that gives television viewers the right to reception without interference. They will have to find some other means of ensuring reception such as taller antennas." The Lake County state's attorney filed a notice of appeal to the Illinois Supreme Court, which ultimately decided in favor of Sears. In his decision on June 12, Judge Charles R. Barrett contended the plaintiffs did not have a right to undistorted television reception. 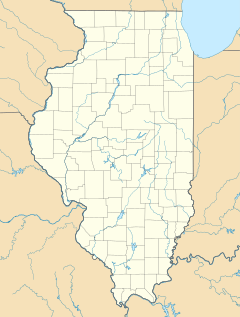 Meanwhile, the Illinois Citizens' Committee for Broadcasting requested the Federal Communications Commission (FCC) halt construction so the building would not interfere with television reception. On May 26, 1972, the Commission declined to take action on the grounds it did not have jurisdiction. Sears's optimistic growth projections were not met. Competition beyond its traditional rivals (like Montgomery Ward) arose from retailing giants including Kmart, Kohl's, and Walmart. Nor did the tower draw as many tenants as hoped. It stood half-vacant for a decade as a surplus of office space materialized in the 1980s. In 1990, the law firm of Keck, Mahin & Cate decided to move into a development that would become 77 West Wacker Drive, rebuffing Sears's attempts to entice the firm to stay. Just two years later, Sears began moving its own offices out of the building. In 1994, the tower was sold to Boston-based AEW Capital Management with financing from MetLife. At that time it was one-third vacant. By 1995, Sears had completed its move to a new campus in Hoffman Estates, Illinois. In 1997, Toronto-based TrizecHahn Corporation (then owner of the CN Tower) purchased the building for $110 million, assuming $4 million in liabilities and a $734 million mortgage. In 2003, Trizec surrendered the building to lender MetLife. In 2004, MetLife sold the building to a group of investors including New York-based Joseph Chetrit, Joseph Moinian; Lloyd Goldman; Joseph Cayre and Jeffrey Feil; and Skokie, Illinois-based American Landmark Properties. The quoted price was $840 million, with $825 million held in a mortgage. The building lost several major tenants in the early 2000s due in part to perceived terrorism risk following the September 11 attacks. In June 2006, seven men were arrested by the FBI and charged with plotting to destroy the tower. Deputy FBI Director John Pistole described their plot as "more aspirational than operational". The case went to court in October 2007; after three trials, five of the suspects were convicted and two acquitted. The alleged leader of the group, Narseal Batiste, was sentenced to 13½ years in prison. Meanwhile the building's largest tenant at this time, Ernst & Young, moved to North Wacker Drive in early 2009. In February 2009, the owners announced they were considering a plan to paint the structure silver; this plan was later dropped. The paint would have "rebranded" the building and highlighted its advances in energy efficiency for an estimated $50 million. Since 2007, the owners considered building a hotel on the north side of Jackson, between Wacker and Franklin, near the entrance to the observation deck. The tower's parking garage is beneath the plaza. Building owners say the second building was considered in the original design. The plan was eventually cancelled as city zoning does not permit construction of such a tall tower there. Although Sears's naming rights expired in 2003, the building continued to be called the Sears Tower for several years. 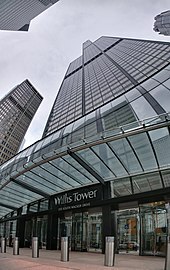 In March 2009, London-based insurance broker Willis Group Holdings agreed to lease a portion of the building and obtained the naming rights. 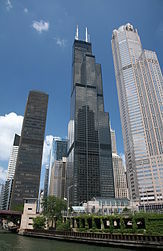 On July 16, 2009, the building was officially renamed Willis Tower. 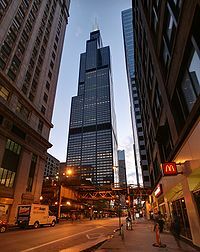 On August 13, 2012, United Airlines announced it would move its corporate headquarters from 77 West Wacker Drive to Willis Tower. In 2015, the Blackstone Group completed purchase of the tower for a reported $1.3 billion, the highest price ever paid for a U.S. property outside New York City. In 2017, Blackstone announced a $500 million "facelift" for the property to include a six-story commercial complex in the tower's plaza area. 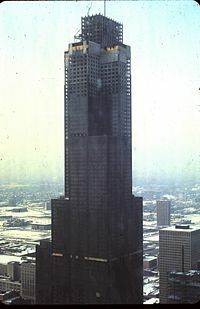 The Willis Tower observation deck, called the Skydeck, opened on June 22, 1974. Located on the 103rd floor at an elevation of 1,353 feet (412.4 m), it is the highest observation deck in the United States and one of Chicago's most famous tourist attractions. Tourists can experience how the building sways in wind and see far over the plains of Illinois and across Lake Michigan to Indiana, Michigan, and Wisconsin in clear conditions. Elevators reach the top in about 60 seconds, allowing occupants to feel the change in pressure as they ascend. 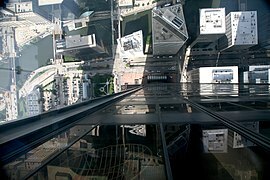 The Skydeck competes with the John Hancock Center's observation floor a mile and a half away but reaching 323 feet (98.5 m) lower. Some 1.7 million tourists visit annually. A second observation deck on the 99th floor serves as a backup. The tourist entrance can be found on the south side of the building along Jackson Boulevard. 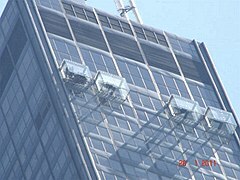 In January 2009, a major renovation of the Skydeck was begun, including the installation of retractable glass balconies which extend approximately 4 feet (1.2 m) from the facade of the 103rd floor, overlooking South Wacker Drive. The all-glass boxes, informally dubbed "The Ledge", allow visitors to see the street below. The boxes, which can accommodate 5 short tons (4.5 metric tons), opened to the public on July 2, 2009. On May 29, 2014, the laminated glass flooring of one of the boxes shattered while visitors were inside but there were no injuries. The Willis Tower remains the second tallest building in the Americas (after One World Trade Center) and the Western Hemisphere. With a pinnacle height of 1,729 feet (527 m), it is the third-tallest freestanding structure in the Americas, 86 feet (26.2 m) shorter than Toronto's CN Tower. It is the eighth-tallest freestanding structure in the world by pinnacle height. At 1,482.6 feet (451.9 m) tall, including decorative spires, the Petronas Twin Towers in Kuala Lumpur, Malaysia, controversially claimed to be the tallest building in the world in 1998. In the ensuing controversy, four categories of "tallest building" were created. Of these, Petronas was the tallest in the category of height to the top of architectural elements, meaning spires but not antennas. Taipei 101 in Taiwan claimed the record in three of the four categories in 2004 to become recognized as the tallest building in the world. Taipei 101 surpassed the Petronas Twin Towers in spire height and the Sears Tower in roof height and highest occupied floor. The tower retained one record: its antenna exceeded Taipei 101's spire in height. In 2008, Shanghai World Financial Center claimed the records of tallest building by roof and highest occupied floor. On August 12, 2007, the Burj Khalifa in Dubai was reported by its developers to have surpassed the tower in all height categories. Upon completion, One World Trade Center in New York City surpassed the Willis Tower through its structural and pinnacle heights, but not by roof, observation deck elevation, or highest occupied floor. Until 2000 the tower did not hold the record for being the tallest building by pinnacle height. From 1969 to 1978, this record was held by John Hancock Center, whose antenna reached a height of 1,500 feet (457.2 m), 49 feet (14.9 m) taller than the Sears Tower's original height. One World Trade Center became taller by pinnacle height with the addition of a 359-foot (109.4-meter) antenna, bringing its total height to 1,727 feet (526.4 m). In 1982, two antennas were installed which brought its total height to 1,707 feet (520.3 m), making it taller than the John Hancock Center but not One World Trade Center. However, the extension of the tower's western antenna in June 2000 to 1,729 feet (527 m) allowed it to just barely claim the title of tallest building by pinnacle height. On May 25, 1981, Dan Goodwin, wearing a homemade Spider-Man suit while using suction cups, camming devices, and sky hooks, and despite several attempts by the Chicago Fire Department to stop him, made the first successful outside ascent of the tower. Goodwin was arrested at the top after the seven-hour climb and was later charged with trespassing. Goodwin stated that the reason he made the climb was to call attention to shortcomings in high-rise rescue and firefighting techniques. After a lengthy interrogation by Chicago's District Attorney and Fire Commissioner, Goodwin was officially released from jail. In August 1999, French urban climber Alain "Spiderman" Robert, using only his bare hands and bare feet, scaled the building's exterior glass and steel wall all the way to the top. A thick fog settled in near the end of his climb, making the last 20 stories of the building's glass and steel exterior slippery. Although Sears sold the tower in 1994 and had completely vacated it by 1995, the company retained the naming rights to the building through 2003. The new owners were rebuffed in renaming deals with CDW Corp in 2005 and the U.S. Olympic Committee in 2008. London-based insurance broker Willis Group Holdings, Ltd. leased more than 140,000 square feet (13,000 m2) of space on three floors in 2009. A Willis spokesman said the naming rights were obtained as part of the negotiations at no cost to Willis and the building was renamed Willis Tower on July 16, 2009. The naming rights are valid for 15 years, so it is possible that the building's name could change again as soon as 2024. The Chicago Tribune joked that the building's new name reminded them of the oft-repeated "What you talkin' 'bout, Willis?" catchphrase from the 1980s American television sitcom Diff'rent Strokes and considered the name-change ill-advised in "a city with a deep appreciation of tradition and a healthy ego, where some Chicagoans still mourn the switch from Marshall Field's to Macy's". This feeling was confirmed in a July 16, 2009 CNN article in which some Chicago area residents expressed reluctance to accept the Willis Tower name, and in an article that appeared in the October 2010 issue of Chicago magazine that ranked the building among Chicago's 40 most important, the author pointedly refused to acknowledge the name change and referred to the building as the "Sears Tower". Time magazine called the name change one of the top 10 worst corporate name changes and pointed to negative press coverage by local news outlets and online petitions from angry residents. The naming rights issue continued into 2013, when Eric Zorn noted in the Chicago Tribute that "We're stubborn about such things. This month marked four years since the former Sears Tower was re-christened Willis Tower, and the new name has yet to stick." The building leans about 4 inches (10.2 cm) to the west due to its slightly asymmetrical design, placing unequal loads on its foundation. 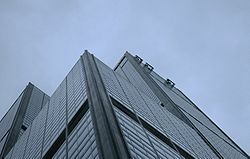 The design for Willis Tower incorporates nine steel-unit square tubes in a 3-tube by 3-tube arrangement, with each having the footprint of 75 ft × 75 ft (22.9 m × 22.9 m). Willis Tower was the first building for which this design was used. The design allows the addition of extra height to the tower if necessary. The restrooms on the 103rd floor, at 1,353 feet (412.4 m) high, are the highest (relative to street level) in the Western Hemisphere. The design was inspired by an advertisement for a package of cigarettes. The Franklin Street entrance is the point from which all building heights are measured. The Wacker Drive entrance is six feet higher than the Franklin Street entrance, lower Wacker Drive/Lower Level 1 is approximately 17 feet, 6 inches lower than the Wacker Drive entrance and 11 feet, six inches lower than Franklin Street. The 103rd floor observation deck is 1,354 feet above the Franklin Street entrance. 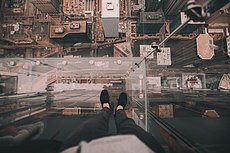 The glass ledges in the Skydeck are on a raised platform 18 inches higher than the rest of the 103rd floor or 1,349 feet, six inches above the Wacker Drive entrance, 1,355 feet, six inches above the Franklin Street entrance and 1,367 feet above lower Wacker Drive/Lower Level 1. The Skydeck elevators rise from Lower Level 2 which gives a total rise of approximately 1,382 feet to the 103rd floor. It remains the world's tallest steel-construction building. All taller buildings use concrete or composite construction. Many broadcast station transmitters are located at the top of Willis Tower. Each list is ranked by height from the top down. Stations at the same height on the same mast indicate the use of a diplexer into the same shared antenna. Due to its extreme height, FM stations (all class B) are very limited in power output. NOAA Weather Radio station KWO39 transmits off the tower at 162.550 MHz. Programmed by the National Weather Service Weather Forecast Office in Chicago, it is equipped with Specific Area Message Encoding (SAME), which sets off a siren on specially-programmed weather radios to alert of an impending hazard. The building has appeared in numerous films and television shows set in Chicago such as Ferris Bueller's Day Off, where Ferris and company visit the observation deck. Late Night with Conan O'Brien introduced a character called The Sears Tower Dressed In Sears Clothing when the show visited Chicago in 2006. The building is also featured in History Channel's Life After People, in which it and other human-made landmarks suffer from neglect without humans around, collapsing two hundred years after people are gone. In an episode of the television series Monk, Adrian Monk tries to conquer his fear of heights by imagining that he is on top of the tower. In an episode of Kenan and Kel, Kenan Rockmore and Kel Kimble decide to climb to the top of the tower so Kenan can declare his love for a girl, but they end up getting stuck on a window washer's platform 110 stories up. 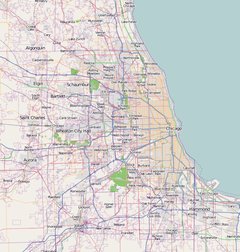 The Chicago Franchise frequently features locations where the tower is visible in the distance. In the movie Category 6: Day of Destruction, it is damaged by a tornado. In "1969", a Season 2 episode of the science-fiction series Stargate SG-1, the SG-1 team accidentally travels back in time to the titular year. 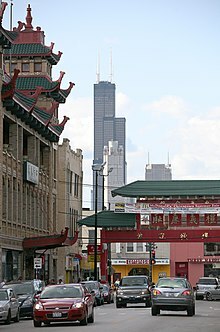 At one point the team travels though Chicago and the tower is shown (erroneously, since construction did not begin on the tower until two years later in 1971). In the 2004 film I, Robot, the tower is shown updated in the year 2035 with new triangular antennas. It is portrayed as having surpassed the height of the fictional USR (United States Robotics) Building. In the 2008 film The Dark Knight, it is part of Gotham City. In the 2011 film Transformers: Dark of the Moon, it is featured in a number of scenes. The most notable one is when the N.E.S.T team tries to enter the city using V-22 Osprey helicopters. They use Willis Tower for cover before using wing suits to descend into the city streets. In the 2013 film Man of Steel, the tower was the location of the offices of the Daily Planet. In the 2014 film Divergent, it is shown abandoned and decayed in a future Chicago. In the 2015 film Jupiter Ascending, the tower is featured prominently as the place where Caine and Jupiter await a spaceship to lift them off the planet. In the 2018 film Rampage, the Energyne corporation is headquartered in the building and uses tower's antenna to broadcast an echolocation signal that would attract three mutated monsters. After the antenna is destroyed, the entire building topples to the ground. Older versions of Microsoft Flight Simulator would begin with the player on the runway of Meigs Field, facing a virtual version of the tower. In Sufjan Stevens' 2005 album Illinois, the tower is referenced in the track "Seer's Tower." 900 North Michigan, Park Tower, the John Hancock Center, the Trump Tower, and Aon Center (L-R) as seen from Willis Tower Skydeck. ^ de la Merced, Michael J. (March 16, 2014). "Blackstone Group Purchases Landmark Willis Tower in Chicago". The New York Times. Retrieved August 11, 2015. ^ a b c d e f g h "Willis Tower – The Skyscraper Center". Council on Tall Buildings and Urban Habitat. June 13, 2015. Retrieved June 13, 2015. ^ a b "History and Facts - Willis Tower". willistower.com. ^ "Five things you need to know about pioneering architect Fazlur Rahman Khan". The Independent. London. April 3, 2017. ^ Snyder, Brett (December 16, 2013). "A Day with United Management: Elite Status, Mileage Devaluation, and Increasing Change Fees". The Cranky Flier. Retrieved December 18, 2013. ^ a b c Ecker, Danny (2018-04-16). "Morgan Stanley moving second office to Willis Tower". Crain's Chicago Business. Retrieved 2018-10-03. ^ Kerch, Steve (October 20, 1991). "This job is a tall order: Sears Tower project is the height of redevelopment." Chicago Tribune. ^ National Academy of Engineering (1979). Memorial Tributes. National Academies. NAP:14723. ^ "Burj Dubai: The new pinnacle of vanity". Telegraph. Retrieved February 25, 2014. ^ "Top 10 world's tallest steel buildings". Constructionweekonline.com. Retrieved February 25, 2014. ^ "Fazlur Khan Sculpture". SEAOI. Retrieved February 25, 2014. ^ "Databank: Sears Tower", Wonders of the World, PBS Databank. Retrieved November 19, 2007. ^ "Inflation Calculator – Find US Dollar's Value from 1913–2015". US Inflation Calculator. ^ Chicago Tribune, April 9, 1972 and Chicago Tribune, May 7, 1972. ^ Chicago Tribune, May 18, 1972. ^ Chicago Tribune, June 10, 1972. ^ Chicago Tribune, June 13, 1972. ^ Chicago Tribune, July 1, 1972. ^ Chicago Tribune, September 12, 1972; Illinois Citizens Committee for Broadcasting v. Federal Communications Commission, 467 F. 2d 1397 (7th Cir. 1972). ^ Peo. Ex Rel. Hoogasiam v. Sears Robebuck, Ill. 52 L. 2d 301 (1972). ^ "77 W. Wacker ready to go." Chicago Sun-Times. March 12, 1990. Retrieved on November 12, 2009. ^ "Sears Picks Hoffman Estates". tribunedigital-chicagotribune. Retrieved 2018-02-09. ^ "Sears Tower Gets a Much-Needed New Tenant". NPR.org. Retrieved 2018-10-03. ^ "FBI Killed Plot in Talking Stage". New York Times, June 24, 2006. ^ "Seven charged over 'Chicago plot'". BBC News, June 23, 2006. ^ "Sears Tower 'plot trial' begins", BBC News, October 3, 2007. ^ "Five guilty in Chicago bomb plot", BBC News, May 12, 2009. ^ "Sears Tower bomb plot leader Narseal Batiste jailed", BBC News, November 20, 2009. ^ "Sears Tower to Lose Largest Tenant - The Chicago 77". www.thechicago77.com. Retrieved 2018-10-03. ^ "Tallest Building in Western Hemisphere is Renamed Willis Tower" (Press release). Willis Group. July 16, 2009. Retrieved June 13, 2015. ^ "Willis Tower in line for a $500 million facelift". Chicago Sun-Times. Retrieved 2018-10-03. ^ BJ Lutz (May 30, 2014). "Coating on Willis Tower Skydeck's Ledge Cracks Under Tourists". Nbcchicago.com. Retrieved August 26, 2014. ^ "Height: The History of Measuring Tall Buildings". Council on Tall Buildings and Urban Habitat. Retrieved May 1, 2012. ^ "Burj Khalifa surpasses the height of Sears Tower in Chicago". Visitdubai.info. December 9, 2007. Retrieved October 31, 2011. ^ "Freedom Tower ("World Trade Center 1")". NYC Tower. Archived from the original on December 21, 2008. Retrieved November 30, 2008. ^ "Chicago Cubs History and News – Welcome to Just One Bad Century". Justonebadcentury.com. Archived from the original on March 20, 2012. Retrieved October 31, 2011. ^ "Sears Tower in Chicago Is Scaled by Stunt Man". Chicago (Ill): New York Times. May 26, 1981. Retrieved October 31, 2011. ^ "Spiderman scales Sears Tower w/Stan Lee interview". YouTube. Retrieved January 13, 2009. ^ "'Spiderman' scales Sears Tower in Chicago – August 20, 1999". CNN. Retrieved September 14, 2009. ^ "Sears Tower name to change to Willis Tower". Chicago Tribune. March 12, 2009. Archived from the original on April 19, 2009. Retrieved May 1, 2009. ^ "Sears Tower Now Willis". Chicago Tribune. July 16, 2009. Retrieved July 16, 2009. ^ Corfman, Thomas A. (March 11, 2009). "Willis could get Sears Tower naming rights". Chicago Real Estate Daily. Retrieved October 31, 2011. ^ a b Podmolik, Mary Ellen (July 16, 2009). "Sears Tower name change: Building today officially becomes Willis Tower". Chicago Tribune. Retrieved July 16, 2009. ^ Burns, Greg (July 16, 2009). "Burns on Business, Willis Wants to be Part of Chicago by Way of Jersey". Chicago Tribune. Retrieved July 16, 2009. ^ Podmolik, Mary Ellen (2009). "Sears Tower name change has few Chicago fans – Willis Tower may have trouble winning over public". Chicago Tribune. The Tribune Company (March 13, 2009). ^ "Sears Tower Now Named Willis Tower". CNN. July 16, 2009. Retrieved July 17, 2009. ^ Johnson, Geoffrey (2010). "Top 40 Buildings in Chicago". Chicago. The Tribune Company (October 2010). ^ Suddath, Claire (February 8, 2010). "Top 10 Worst Corporate Name Changes: It's the Sears Tower". TIME. Retrieved February 8, 2010. ^ Zorn, Eric (2013). "Change of Subject – 'Thillens Stadium' is no more". Chicago Tribune. The Tribune Company (June 24, 2013). ^ "Sears Tower". Tallest Building in the World. September 2, 2007. Retrieved September 14, 2009. ^ "Why Was the Sears Tower Built?". Whyguides.com. June 5, 2000. Retrieved October 31, 2011. ^ "CrediFi". Sears Tower. Retrieved September 19, 2016. ^ "100 Tallest Completed Buildings in the World". Council on Tall Buildings & Urban Habitat. Retrieved 4 October 2017. ^ "FM Query Results – Audio Division (FCC) USA". Fcc.gov. Retrieved September 7, 2016. ^ "TV Query Results – Video Division (FCC) USA". Fcc.gov. Retrieved September 7, 2016. ^ "Filming Locations for Ferris Bueller's Day Off". Movie-locations.com. Retrieved September 14, 2009. ^ "The Sears Tower Dressed In Sears Clothing". Nbc5.com. Archived from the original on March 2, 2008. Retrieved October 31, 2011. ^ Keith Darcé (January 31, 2007). "Madison Avenue turns to Main Street | The San Diego Union-Tribune". Signonsandiego.com. Retrieved September 14, 2009. ^ Merrion, Paul (September 7, 2011). "Willis Tower, CBOT Building star in Superman filming". ChicagoBusiness. Retrieved July 26, 2013.